Capture accurate, non-destructive moisture readings up to 0.75" below material surfaces using the integrated pinless sensor. 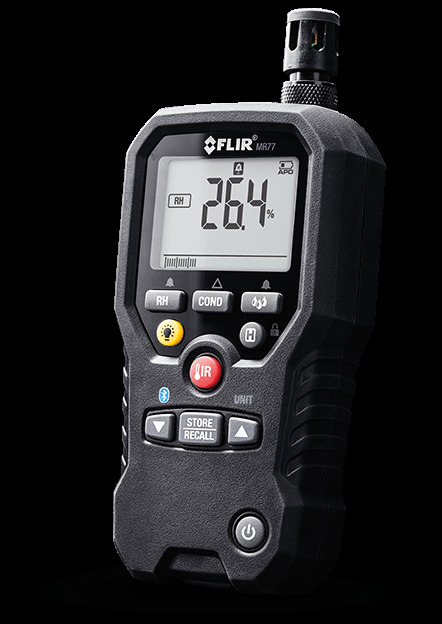 Monitor moisture levels in hard-to-reach areas using the FLIR MR77’s external pin probe on 30" wire. Quickly capture spot temperatures using the non-contact, IR thermometer with laser spot. Large, clear LCD screen simultaneously displays moisture, relative humidity, and air temperatures. Upload data to FLIR Tools Mobile software so you can easily turn moisture/environmental trending graphs into professional reports. Embed moisture readings into thermal images from METERLiNK-enabled FLIR IR cameras for enhanced documentation/reporting. Double-molded, rubberized case is shock-resistant from drops from as high as two meters to bolster reliability and durability. Designed to resist contamination, the temperature/humidity sensor is field replaceable to keep the unit in action on the job site.